So I know that December first is quickly approaching and under ‘normal’ circumstances, I would have switched out my November Stations this past weekend, but I still have three days of November stations left. I don’t want to cut my kinders short . . . So I staged my December Stations this weekend so come Wednesday afternoon, I can quickly switch them out. Plus this way I can give you all a little preview in case you are still looking for some ideas of your own. I hope you find something you can use, and, of course, I will post these stations in action once we start them later this week so make sure you stop back. So each month before I do any planning, I try to take a look at the skills my students are needing more practice with and also where they are showing some increased interest. I want the practice to valuable, of course, but it’s also important that it be engaging and sometimes just plain fun. I think fun is ok in kindergarten. Don’t you agree? Also, just a little FYI . . . I added a couple of extra stations this month because I have a couple of days I’m taking at the end of the month when MacKale has his port removed (Hallelujah!!! ), and I don’t want to leave a substitute short. So I planned out the month so that I will have enough stations for the rest of the month. 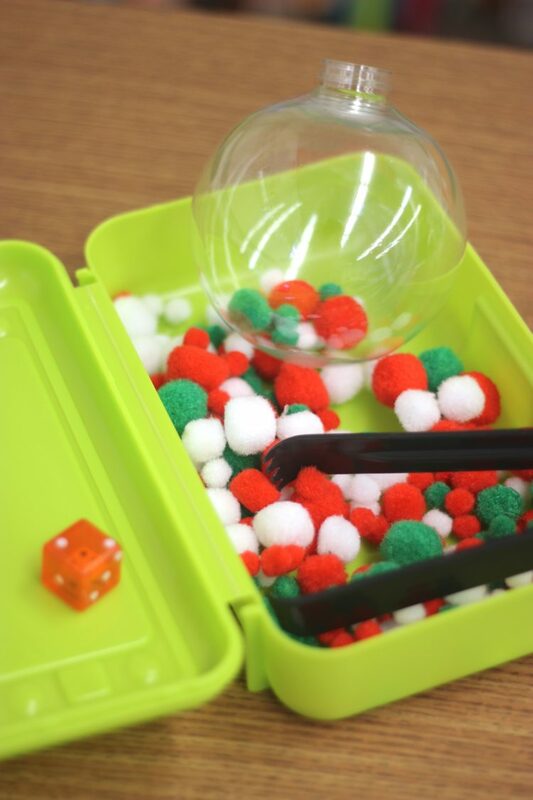 I saw a game similar to this one on Fun A Day using dice and bells, but I wanted to focus on a different set of skills for my kinder so I came up with this one instead. So in this game, I have placed small ornaments with various numbers printed on them in a stocking. Students take turns pulling an ornament and comparing their numbers. They then spin the spinner to determine whether the greater or less than number is the winner. That player gets to take his/her ornament and the one they won and place it on their tree. The person who fills their tree first, is the winner. 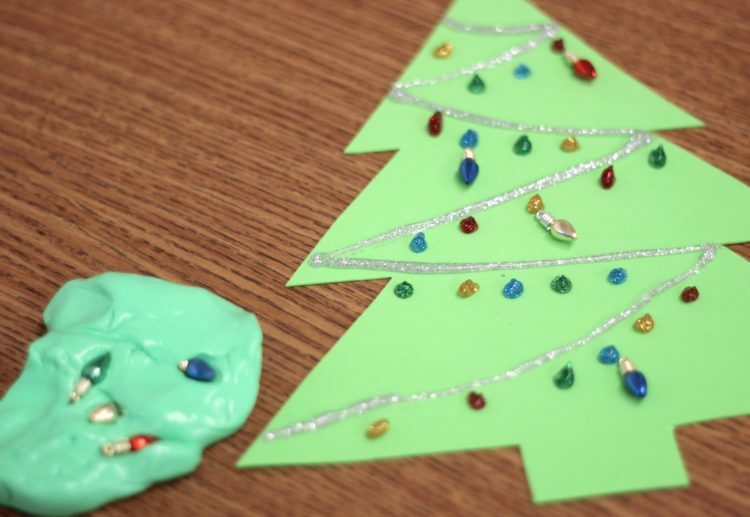 Clear plastic ornaments were just begging to be made into a fine motor game. So, of course, I obliged . . . Simply select the die that suits your needs best. They come is so many varieties these days. 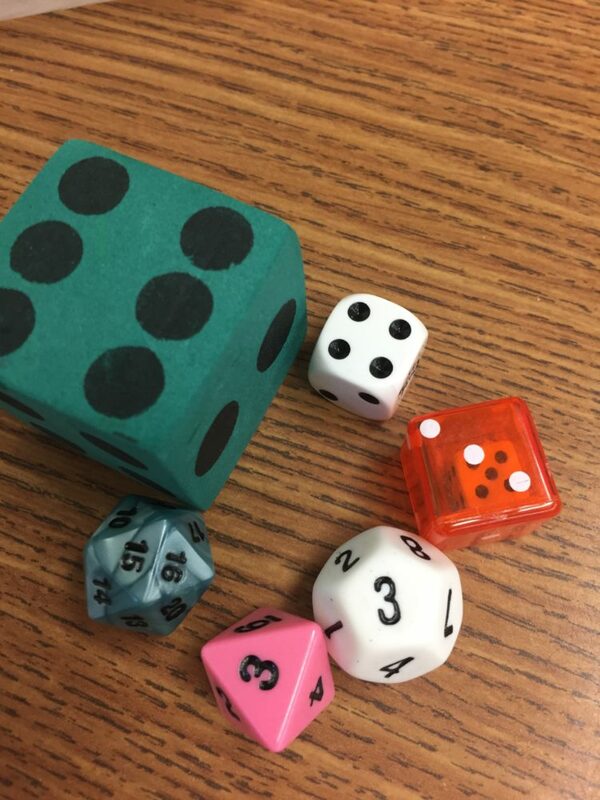 I personally am going to use the dice in dice ones for this activity. But you choose based on your students skill level . 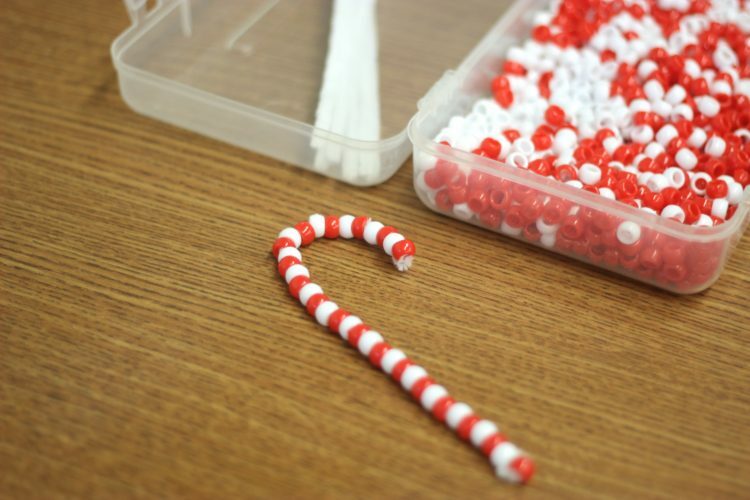 . . Students take turns rolling the die and, using the tongs, place that many pompoms in their ornament. When all the pompoms are gone, they dump their ornaments’ contents and count to see who has the most. Stations don’t have to be complicated. You can never let them play with Play-doh too much. So whenever I can give them the chance, I’m going to indulge them. This time I’m going to work a little peppermint extract into the dough (Ta-dah . . . Holiday Play-doh! 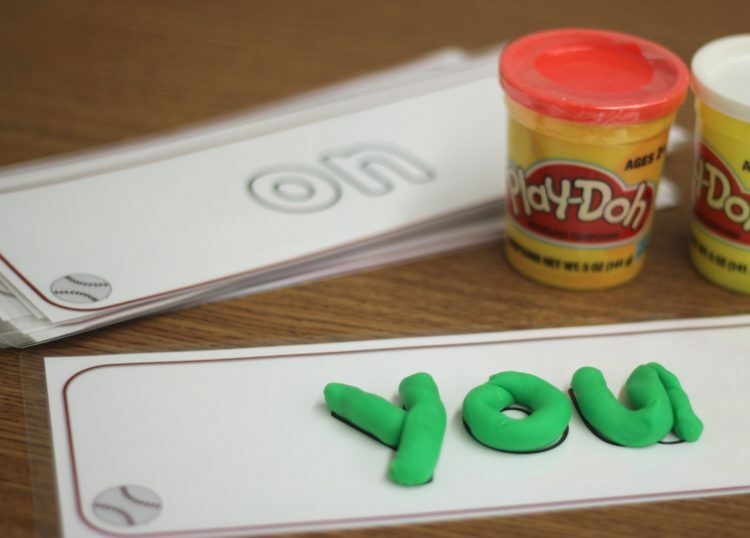 ), and they will select the play-doh mats appropriate for their Ball Word levels to build the words they don’t know yet in their pack. Little Bins for Little Hands was the inspiration for this activity. 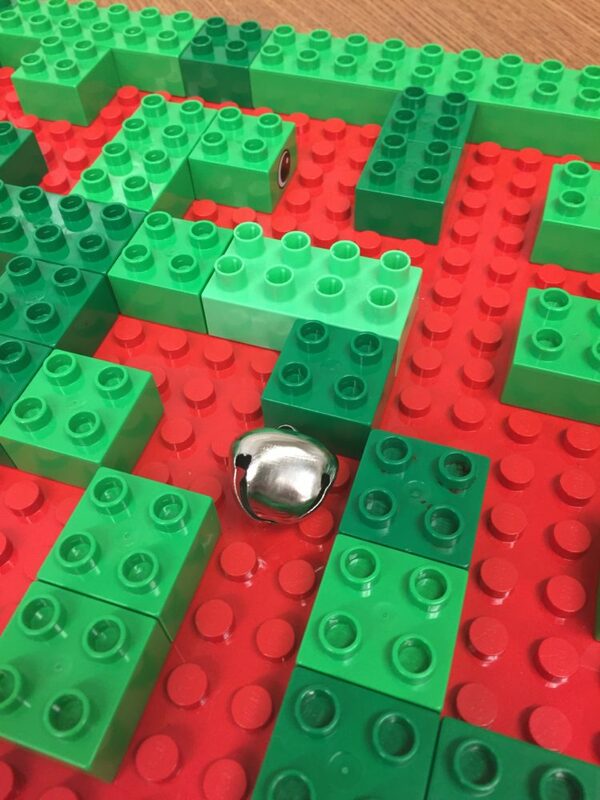 They had posted a marble maze on their site that I loved. But knowing my kinders, I wanted to try it out with Duplos before venturing into Legos. 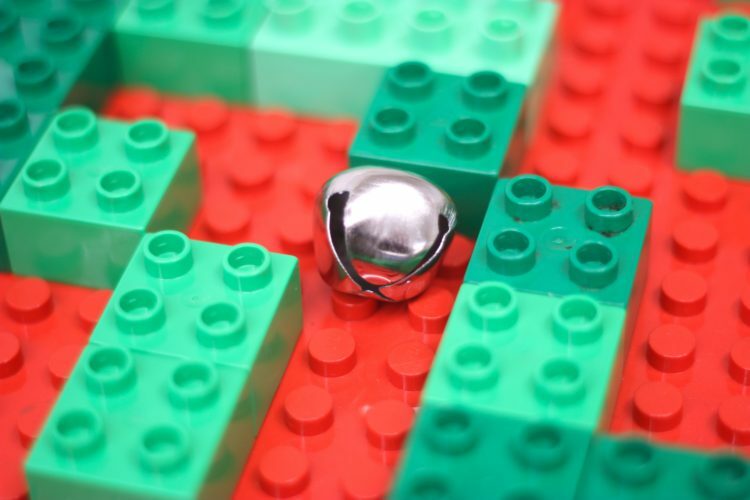 And, I decided to use a large jingle bell instead of marble. It will be a bit slower and more easy to handle while we try this out. Plus it’s just plain festive. It’s a great activity for visual perception and motor control. The fine motor part comes in when I have them design their own maze for the next set of students to use that station the next day. I had MaGill try it out and he approved. So maybe if it works out, we can move on to Legos next month. Do you remember the Web Master activity from October? It was such a hit and then I saw how someone (I have searched for the source and can’t find it. So if you see it . . . any of you . . . let me know so I credit them.) did the same thing with garland. BRILLIANT. So here is the Web Master game but with a holiday twist. 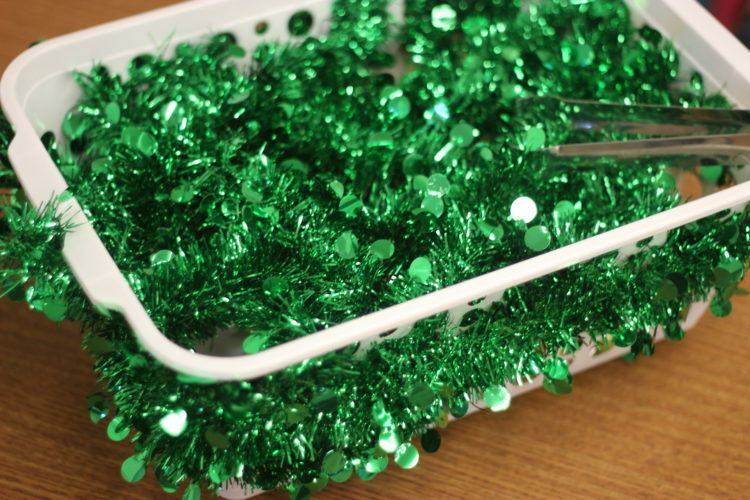 It’s just cheap, thin garland threaded through a basket with several large holes. Then I placed various ornaments at the bottom. Of course, it isn’t just enough for them to locate those various ornaments and secure them for their own using only some tongs. They have to do it without dropping them. And there are ‘special’ ornaments. If they happen to get one they may be able to steal some ornaments from a friend or have to return some ornaments to the basket. This keeps play interesting. In the end, the one with the most ornaments, is the ‘merriest’ of all. What’s the academic value of this activity? Hmmm . . . patterning . . . following directions . . . having fun? Yep that would do it. I love the value of using beads for hand-eye coordination anyway and this seems like a pretty good excuse to let them make an ornament of their own. My kinders are obsessed these days with practicing their Ball Words (This is my sight word fluency system.). 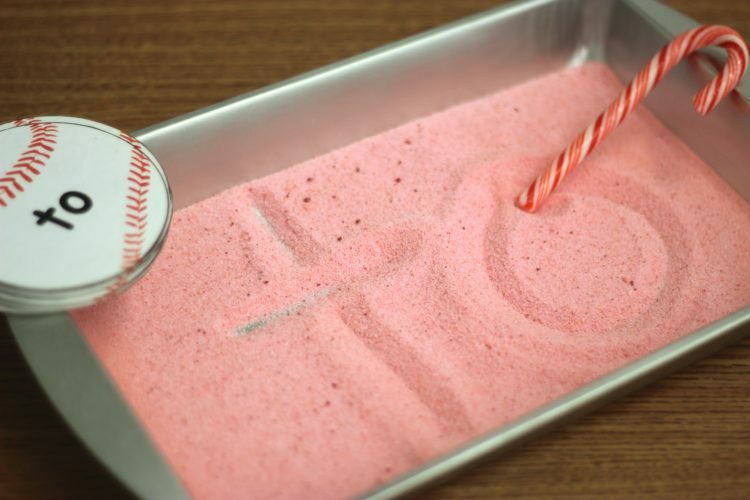 This activity feeds their obsession by giving them a chance to practice using ‘peppermint sand.’ It’s really just some salt that has peppermint extract and red food coloring (You could use green if you’d rather.) backed at 200 degrees in the oven for about 5-10 minutes. Don’t be shy with the peppermint. I love the smell and it gives students the full sensory experience. 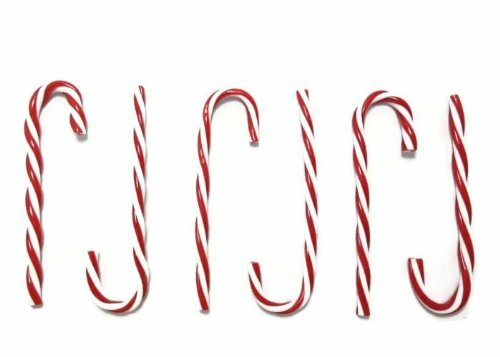 I have real candy canes here that they can use to write their words, but I have to tell you . . . the thought kind of grosses me out. 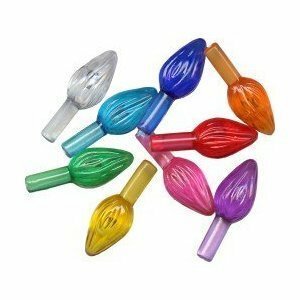 So ordered some of these plastic candy canes that I’m going to have them use instead. I could just see those real ones getting sticky and nasty. 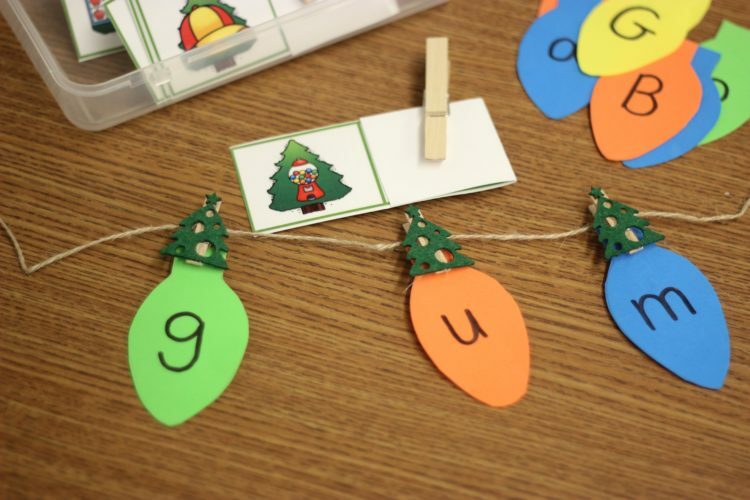 I needed an activity for my students to start working with simple CVC words. This one seemed like a fun option. I Can Teach My Child had an activity where you matched lowercase and capital letters with foam lights similar to the ones below, but I needed something a bit beyond that. Students select a self-correcting card like the one above. They then make the word by using the foam lights and stringing them on the twine with the small clothes pins. When they are done, they simply open the card to see if they made the word correctly. I plan on hanging my twine between two command hooks on my closet door. You can’t have fine motor bins without pokey pins. There are so many options in Mrs. Miner’s Christmas pack, but these were a couple of my favorites. 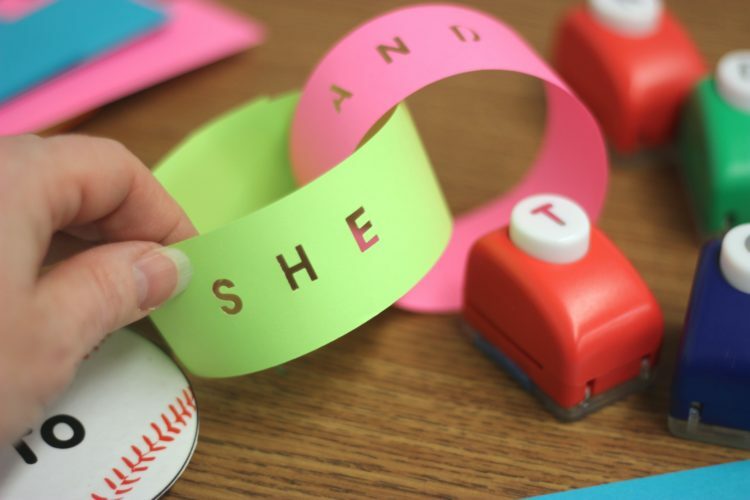 Making paper garland in kindergarten is kind of a right of passage, but I needed to give it a bit of a twist so I decided it was time to break out my letter hole punches. 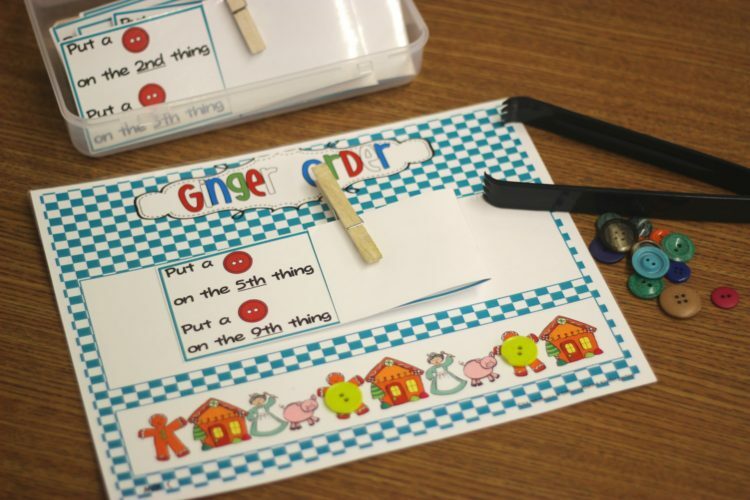 Using the sight word cards that they are practicing and at their level, students will punch out their words using paper hole punches. This will be the first time I’ve introduced these. I like to wait a bit because I need to know that students understand that we don’t normally write in all capitals, but since this is the way the punches come, it’s ok to practice this way when we have to do so. 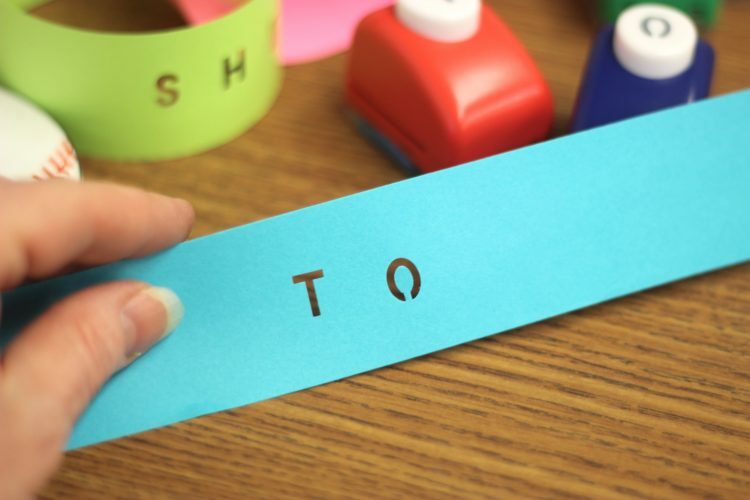 Students simply take that punched strip of paper and glue it together to make a garland. I know these aren’t the traditional holiday colors, but I can’t resist my Astrobrights colors. Since these shades are the colors of my room and I plan on using them to decorate, I think it’s ok to be a bit untraditional. More therapy putty love! I do love it so and so do my kinders. I was lucky enough to find these tiny little Christmas lights years ago and never knew what I was going to do with them until now. They are tiny and perfect. But I do think if you can’t find something exactly like these, those little plastic lights you use for ceramic Christmas trees would also work perfectly too. I made a couple of foam Christmas trees and marked them with the same colors as the lights. Then I head the lights in the putty. 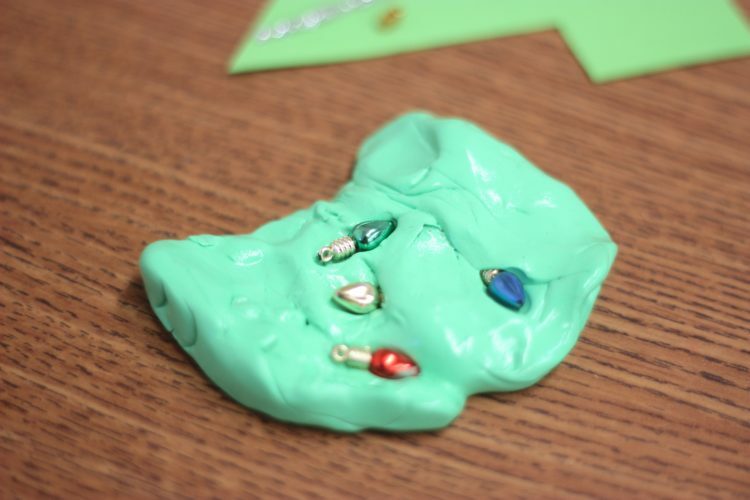 Students will have to search the putty for the lights and ‘light’ their tree by placing the matching color light below the colored dot on the tree. The first one to light their tree with all the matching colors is the winner. 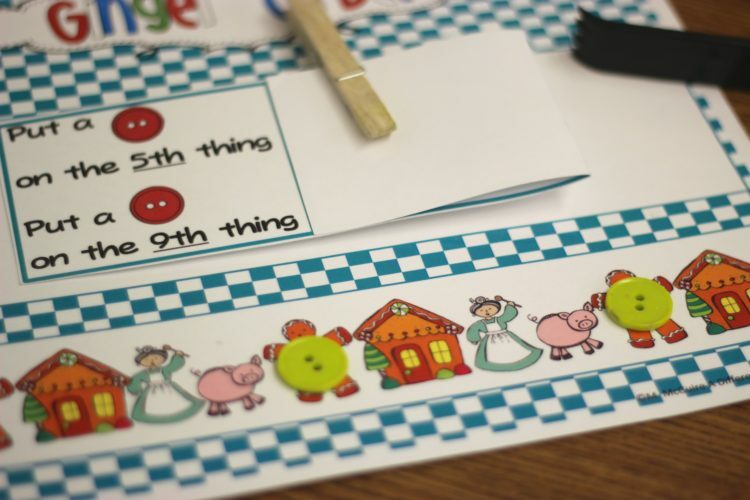 Buttons and ordinal numbers. In this activity you’ll find both. The self-correcting cards make it delightfully independent. Students select a card and place it on their mat. They then use a tong to place a button in the location indicated on the card. When they have done this, they open the card to see if they completed the task correctly. I have so many spinner activities, and I love that this one simply needs to have a card traded out to be differentiated. My kinders this year need a ton of practice just coloring. 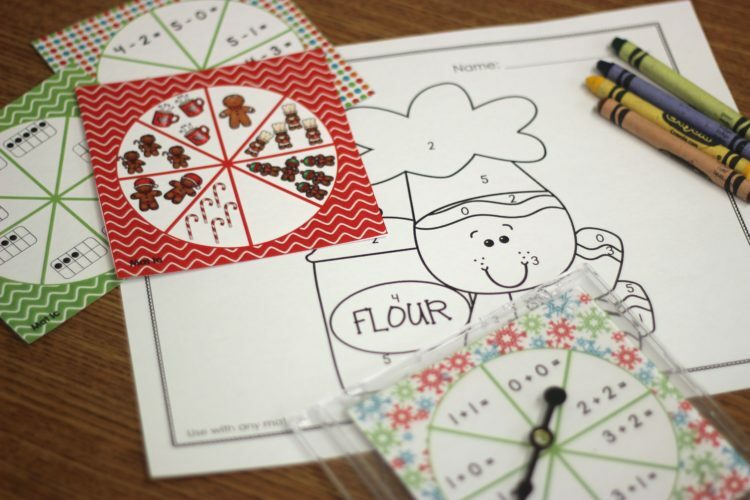 This activity gives them math and coloring. Be the first to trim your tree. But it’s not as easy as it seems. I simply took a piece of foam and painted a tree on it. 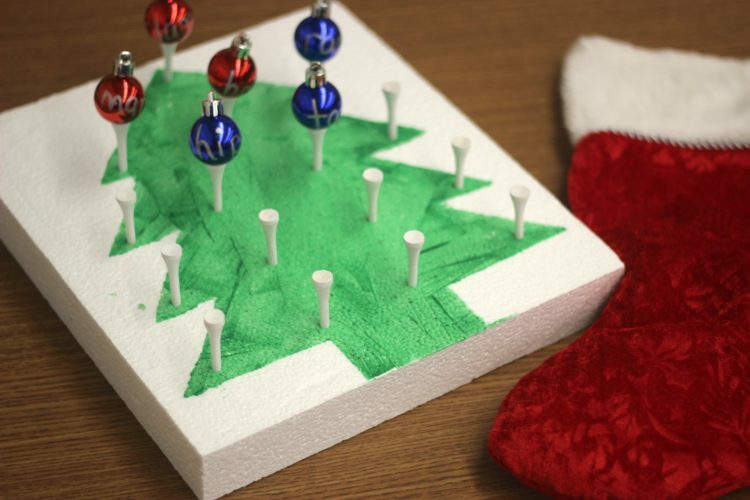 Then I pushed white golf tees into various positions on the tree. 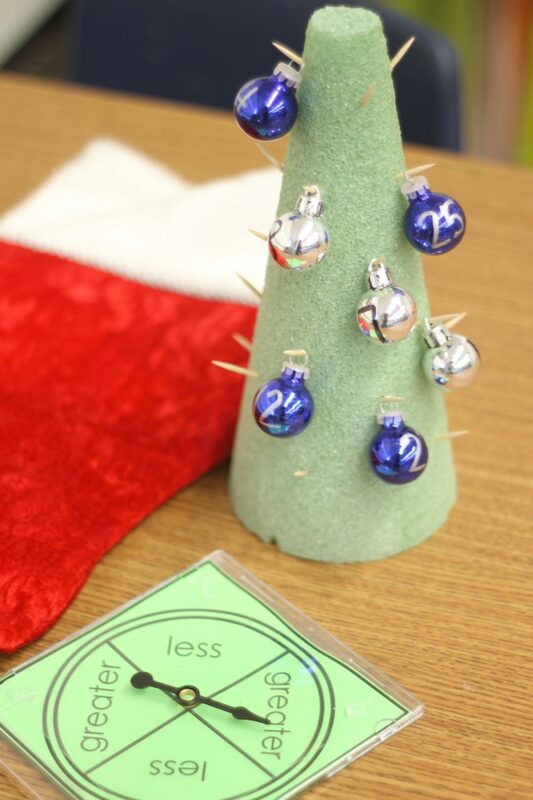 To play, students will select an ornament from the stocking and read it. (Some have CVC words and the other stocking has letters. 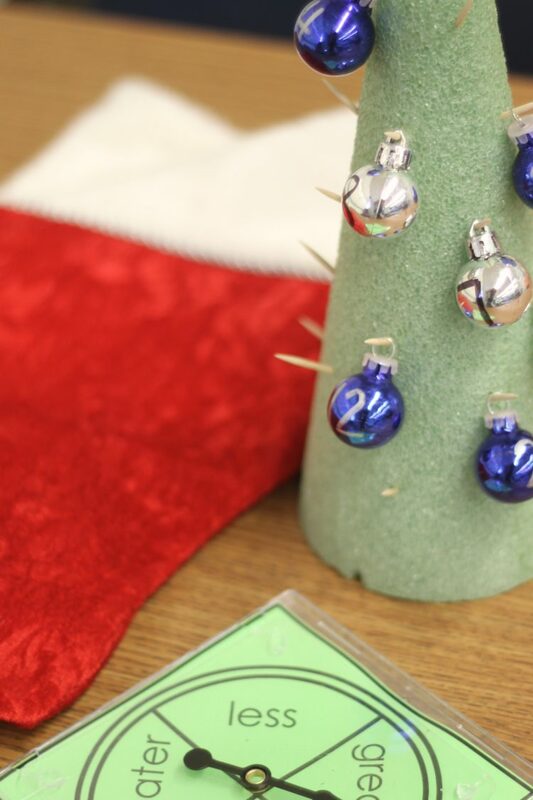 Students will use the stocking that is appropriate based on their readiness level.) 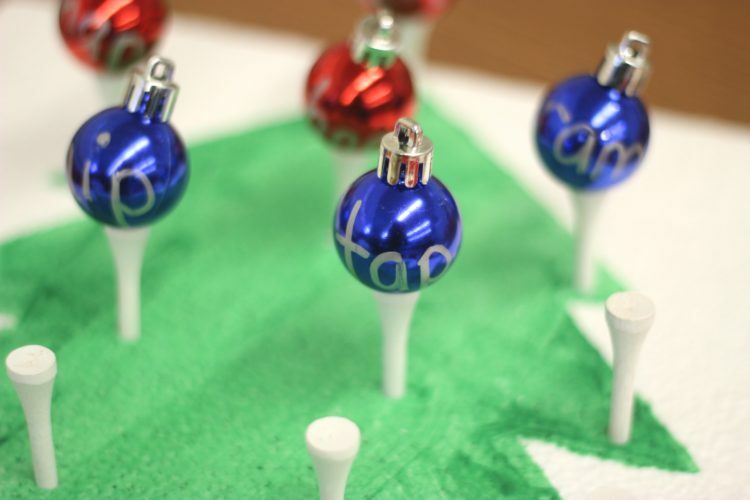 If they read it correctly, they can ‘trim their tree’ by balancing the ornament on a tee. 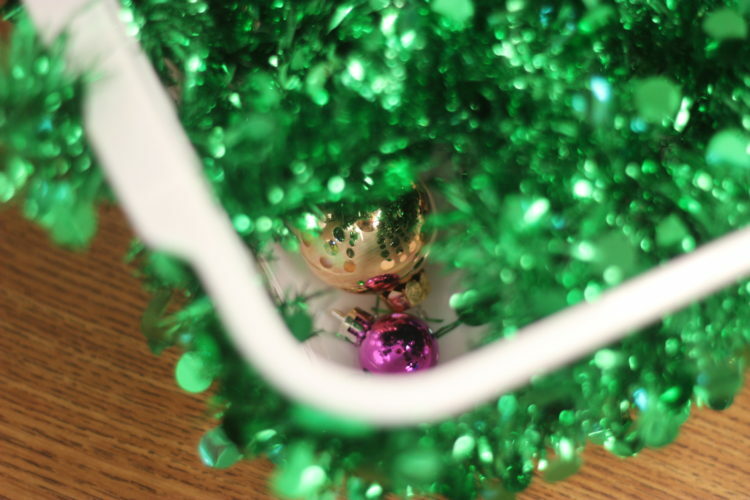 There are some special bulbs that I place in there that allows them to steal ornaments from a friend or makes it necessary to put an ornament back in the stocking. These special ornaments makes it possible for anyone to when and keeps play interesting. The first person to get all the tees on their tree filled with ornaments, wins. So there you have a little preview of what I have planned for December. Make sure you stop back in and see all these in action over the next couple of weeks. Also, if you’d like to check out my other Morning Work posts, you can do that by clicking HERE. UPDATE: After spending the last year posting about morning work and presenting workshops to teachers across the country, I had numerous special requests from teachers who required more than just 12 stations, ‘I Can’ sheets with standards and skills indicated and who had numerous questions. 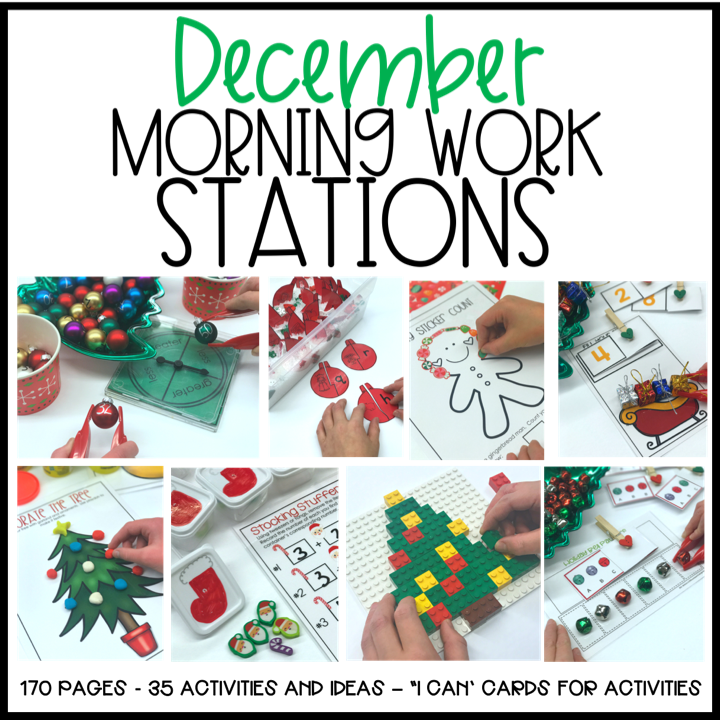 Taking all those requests and questions, I put together a Getting Started With Morning Stations packet and now an expanded October, November and December Morning Work Station packet with over 35 Morning Work Station Activities. If you’d like to learn more about the getting started packet, just click HERE. Or click on the picture below to find out more about December. I’ve got to ask about the ball word play dough mats–do you have these for sale somewhere? I use your ball word system & would love these too! The play dough mats are in the revised version of the ball words on TPT. Just download the kit again and you can create your own. Look for baseball words 2016. Love, love, love these ideas!! I teach a child whose family doesn’t celebrate holidays. 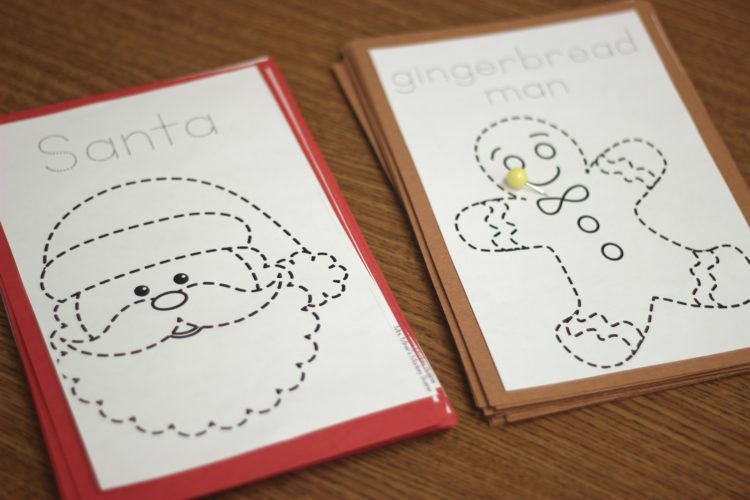 I am actively thinking about ways I could still do these activities with a non-Christmas feeling to them. Amazing activities!! Thanks for sharing! 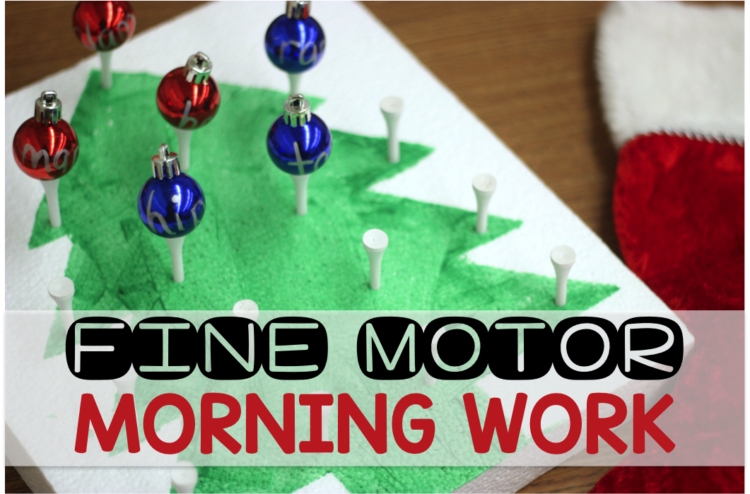 I have some of your fine motor activities for morning work, and as much as I remind the kids to use them correctly, they do what they want with them. How do you keep the kids using them properly? I see that the alphabet punches are out of stock for now, but I’ll keep checking. 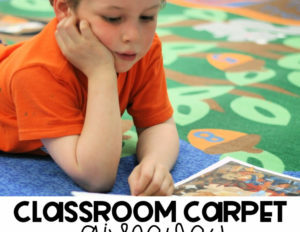 I love the idea for a sight word center!